I am finally beginning to feel that Spring has arrived and will remain for the duration of her season. I think that I have transitioned. Both Mother Nature and I took our own sweet time to change over from Winter. I still had some winter projects to accomplish, and she had a few more cold, snowy days to spit out. You may be feeling slightly overwhelmed with the changes as your own systems are in flux. This pertains to us and to nature. My restorative teacher, Jillian Pransky, said recently that a lot is happening in our soil right now. The components and makeup of the soil are changing daily to accommodate and nurture the new life bursting forth. Sit comfortably and cup the hands over the eyes. The heel of each hand will rest on the upper cheek bone with fingers pointing upward. The eyes are closed. Do not press into the eyes. Try to eliminate any light from the cracks between the fingers by pressing fingers together. Stay like this for a few minutes enjoying the darkness and the breath flow. When you begin to feel more relaxed, try opening the eyes into the dark cupped hands – sensing the darkness around you. You can continue this exercise by lifting the cupped hands about 6 inches away from your eyes, continue to gaze softly to the hands (half lids) then bring the cupped hands back to the eyes for a few rounds of breath. When this is complete for you, release hands and slowly look around you. On your mat, place one bolster where your knees will be and another where your lower legs can rest, one blanket rolled up where the bra line is (base of scapula), and a neck roll for the cervical spine. 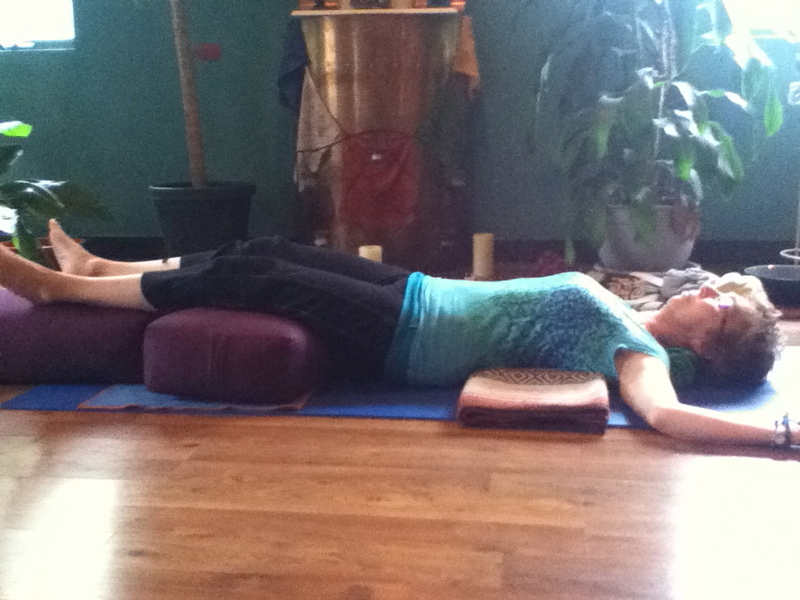 Shoulders rest on the floor, arms to side with palms facing up or come into Goddess arms. 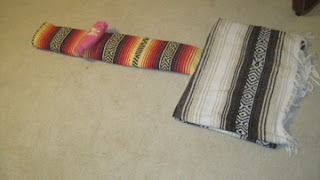 If ankles need support, use rolled-up blanket or dish towel. Eye pillows can lightly rest on eyes or even be used on forehead (useful for headaches) or even on shoulders (wherever you need to release tension). 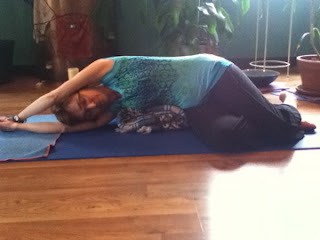 To begin with stay in pose for 10 minutes working up to 20 minutes. 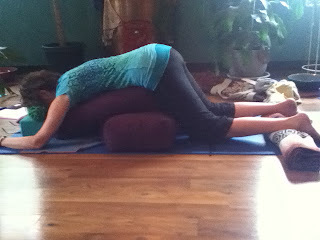 Great to use in savasana. Feel the heart open, the strain from holding yourself up all day evaporate. Benefits: reinvigorates the spine bringing fresh blood and oxygen. With deep breath, can give the effect of a massage on the spine. Roll a single-fold blanket keeping the roll more on the flatter side. This becomes your spinal strip. Lay this strip down on the floor and place a double-folded blanket at one end (Letter T). Sacrum is on the double-folded blanket and carefully lay the spine and head down on rolled up blanket. Use a neck pillow in cervical curve. Arms relax by the sides, palms turned up. A variation is to have knees together, feet wide apart. Stay for about 5 -8 minutes. A nice alternative to the Heart Bench.